Proof that Sonamy is real. i had to admit it's a cute couple. but to tell 你 the truth i never really believed Sonamy was a real Sonic couple. i actually always thought Sonic never loved her. but boy was i wrong. now that i've seen this i actually prefer Sonamy over Sonsal :). Wallpaper and background images in the 刺猬索尼克 club tagged: sonic amy sonic the hedgehog amy rose sonamy. What comic book is this? I would suspect this is for the games only, Archie seems to be more sonsal from what I've heard. But Sonic's 16 and Amy's 12... oh well. how can you say it's not real when it's right there in a magazine confirmed by SEGA? ^ megazines can be falsified. But sonic 15 just saying. Humans are animals, they evolved from apes(also an animal) Humans can make offspring after the start of puberty, a 20 year old can mate with a 50 year old,so yeah age doesn't matter. This SO proves that Sonamy is real and that they're in love..
Just to clarify, Amy is usually portrayed as 12, Sonic as 15 and Sally is 17 /18, So there's a similar age gap between the three of them. in the Japanese version of Sonic X he actually says "i love you Amy"
^ unless stated as canon by the creators then any other work for the verse is non-canon. technically non-canon is a type of canon anyway. being based off the games means nothing, pokemon is based off the games and the games are the main canon. I will never support Sonamy and not even SEGA will change that. ^ some humans do that, cherry picking the most civilised people means nothing. SHADOWKNUXGIRL U BETTER QUIT IT OR ELSE DOOOOOOMMM!!!!!!!!!!!! Well, I can understand the magizine. There again magazines are filled with stupid gossip and rubbish, am I right? 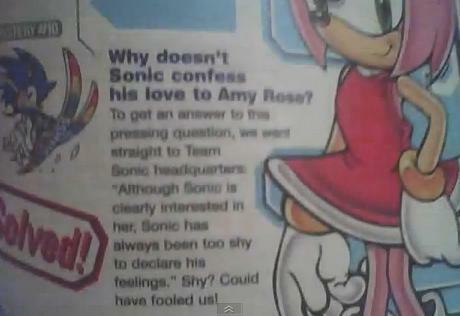 No wonder Sonic's a wuss up to Amy, but not for some people, like me. @sonic1stfangirl everyone has an opinion. My opinion is that I don't approve of Sonamy and never will. And no one, not even SEGA, will change my mind. So deal with it. YES! I totally agree Sally_Fan! I have a pic of this but it's kinda different. How could anyone think Sonamy was faked/ The two are made for each other. -w- they should be brother and sister erm didnt sega say that they wernt going to pair them up. 0.0 amy's such a little girl though, she hits him with her hammer all the time so y? It will take a lot more than an unofficial magazine to convince me that Sonic is somehow hiding feelings for an obsessive fangirl who chases him without warning, ignores his protests, threatens potential love rivals, and at times even gets angry at Sonic himself for rejecting her advances. She's too blinded by obsession to know how to respect Sonic and his feelings, even if she does have a better track record when it comes to other people. *stacycam* well at least amy has one thing better than sonic (or more things), and that's "doing flips in sonic boom, having a hammer, has manners more than sonic sometimes"
Sonic you know she worries about your sorry little *** so if you love amy or not than well?